Athletic musicians moving beyond the physical create music of a transient nature. In a world of miracles, these transient moments are captured on a thin, slightly flexible disc, called a CD. Once you acquire this CD, you will be free to explore the discussion. SMOKE SHADOWS begins in the throes of a conversation about life. From the musical perspective, it is rhythms, notes and sounds. From the life perspective, it is heat, intensity, and expression in the depths. "Everybody was going through something last summer, when these sessions took place. Some had health concerns, some had lifestyle issues, everyone's in financial difficulty these days, and, being conscious people, we looked around and saw what our world was being made into. It was disturbing, and if there are moments in the music which are disturbing, that's coming from the feelings we had when we looked at it." You can experience the moments for yourself. The opening cut seems to let you in the door to a party already in progress. Soon, you are involved, following as more threads are added to the conversation. There are times when someone leads, and times when textures demand the focus. As the conversation builds in intensity, so does the music. If you follow the threads, they will lead you to the end of the first disc, and into the second. That is where the band kicks into a higher gear, spinning Ornette Coleman-like textures and Miles Davis-like jams. You will hear the influences of Art Blakey, Elvin Jones, Jack DeJohnette and Billy Cobham echoed in the percussion section, with drummer Rickie Hopkins being just as at home in the funk pockets of Hip Hop as he is with jazz. Excellent and distinctive bass playing powers J.D. and the Sons of Rhythm, with Dave Holland student Tony Stefanelli's fretless electric Alembic, to the Pastorius-like lines of Kenny Cornelius. Guitarists Frank Singer and Mike Ohm share a common heritage in John Mclaughlin, while Ohm and Sheldon Peterson connect in their original jazz group Potato Battery. Yet each guitarist will also introduce you to their unique influences, with hints of Wes Montgomery, Joe Satriani, McCoy Tyner, Eddie Van Halen, John Abercrombie, Larry Carlton, and Robert Fripp bringing you a guitar style review amidst originality. By the end of disc 2, you are transformed. "We become more connected each time we persue a new project with J.D. and the Sons of Rhythm. The level we achieved here was cathartic. Once a group of musicians goes through this, they reach a point where everyone moves beyond previous limits. All of us have played free before, and each of us have drawn from our experiences. This time we went beyond them." Go beyond your limits. See moments captured, SMOKE SHADOWS frozen in time. 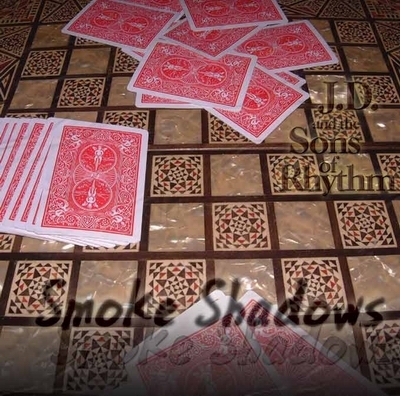 SMOKE SHADOWS, 12 tracks of music on 2 discs. During the time that SMOKE SHADOWS was being created, each band member was experiencing difficult personal growth - challenged with health problems, financial difficulties, personal change, and for all of us, global turmoil. The music that resulted is a conversation about these tumultuous times. We always tune into each other when we play, but this time, we did so more intensely, more deeply, and discovered we understand ourselves and each other better because of it. We played through the smoke and shadows, and we made music.